Introducing the X-1 Driver. The product of 2 years of testing and development. Consider that OEM's (brand name companies) spend millions on advertising, endorsements, and hype. On the other hand, traditionial component companies have taken short cuts, which results in heads that don't measure up to their brand name counterparts. We've approached our club design from a different perspective. We've spent our money on producing the best possible head for every level of golfer. We've designed a head that performs as well at 70 mph as it does at 150 mph. No gimmicks or unfounded claims. We prefer to allow the results to speak for themselves. We have also made the decision to offer the X-1 as a component. We believe this is the new paradigm in the golf world. Golf clubs must b fit and built properly for the individual and the only way to offer this is to offer the X01 as a component. Have your driver made for you to your own personal specifications. It's easy to design a head with maximum C.O.R., but for swing speeds over 115 mph the simple fact is that they break. Making this spring effect work for swings under 100 mph must also be taken into consideration. 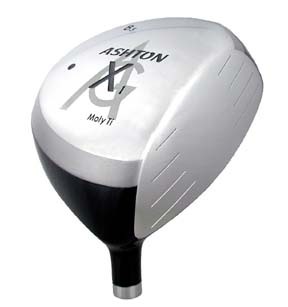 The Ashton Golf X-1 titanium Driver is the first titanium driver that offers both maximum spring effect and durability for golfers of any level. the X-1 Driver is a precision tool made to the same specs and tolerances a sparts manufactured for the aerospace industry. Plasma welded seams for maximum strength and structural integrity. Only the big brand name companies can afford to use Cast technology when producing a driver. Why? The reason is quite simple. A cast head can cost up to three times as much as a forged head to produce. Each loft requires a completely separate mold. With the huge markup the brand names rely on, they can easily absorb the added costs of producing a more expensive head. Lofts-4.5, 5.5, 6.5, 7.5, 8.5, 9.5, 10.5, 12.5, 15.5. Item X1: $169 includes headcover. RH or LH. Shipping $9.95 to continental U.S., $25 to Europe/Canada, $35 to Asia/Australia. Clubmaker Online can build you a fine custom Ashton Fairway wood using your choice of virtually any golf shaft made today. Send us an email and we'd be happy to help you choose the right combination for your game. Try one with the new Fujikura Banzai. Prices start at $219 for the MS-5 Driver, $269 for the X1 Driver, and $139 for the X1 and X1D Fairway woods and XBrid Hybrid.